Cricketing Allsorts, edited by All Out cricket's Jo Harman, contains many amusing anecdotes by All Out Cricket's writers and others. As the book's title also states, it is a mixture of the good, bad and ugly and downright weird thereby giving an idea of what to expect. Written in a similar style to their popular magazine, excerpts of what can be expected include, in the Good category, memorable individual county seasons, cricketing dynasties and memorable sixes. Forgotten gems is a chapter on famous Test innings which may have been dwarfed by more outstanding and perhaps memorable ones. I realise in this day and age that not much escapes media scrutiny so it is perhaps no surprise to find some less salubrious subjects touched upon. Legal battles, batsmen's send-offs from bowlers/fielders and fights and feuds which, understandably, make up part of the Ugly section. There are amusing subjects covered such as nicknames, unlikely statistical quirks and some of cricket's unlikeliest fans which includes Barack Obama. Embarrassing moments including notorious drops and worst overs come under the Bad banner as is the unfortunate run out ninety-nines section. 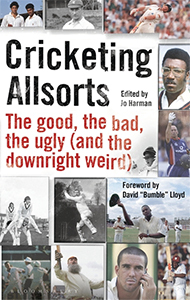 Bloomsbury's publication of Cricketing Allsorts is beautifully and impressively put together and I am sure that fans will enjoy some of the good and bad memories of action dating back to the late 19th century.